ALL NEW ORGANIC SOAP PRODUCTS! Miss Permelia just LOVES jewelry! Everyday you can see her at the General Store with a different pin on. So, we decided to create something especially for Permelia. A whole line of PRIMS! These are "primitive pins" and they can go anywhere and on anything! The prims are carded and have a wire hanger for hanging up! All pins are approx 3 to 4" in size and made entirely of hand dyed wool in prim colors. 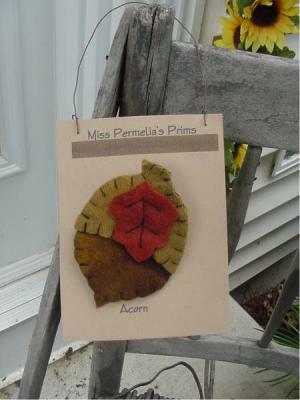 Here is a wonderful pin to welcome in the fall! Be sure to view the other prims available now! Postage is included in price.